As Industry 4.0 solutions become less expensive and more powerful, however, many manufacturers have fallen into the trap of wasting time, money, and resources on implementations that fail to address the most fundamental pain points in their operations. Companies need to be especially wary of four hazards associated with implementing new technologies. These include pursuing small gains while ignoring opportunities for major returns from more promising targets, digitizing processes without addressing underlying inefficiencies, disregarding behavioral root causes of process problems, and pursuing high-tech solutions without assessing the full cost of their implementation and without considering whether simpler alternatives would do the job as well or better for less money. To avoid running afoul of these dangers, companies must gain a detailed understanding of their performance problems before investing in Industry 4.0 solutions. Winning companies will use these insights to define a comprehensive approach to operational excellence that includes optimal applications of digital technology. Many companies investing in Industry 4.0 technologies lose sight of the general rule that 80% of the value achieved comes from solving 20% of the problems at issue. This 80/20 rule—based on the work of economist Vilfredo Pareto—has important implications for effectively overcoming performance problems. Simply put, manufacturers should focus on solving the small number of problems that offer the lion’s share of financial improvement opportunities. In many cases, unfortunately, companies do not know which problems to focus on, because they have not quantified the financial impact of operational improvements. In addition, production experts may be so ­eager to apply advanced analytics and cutting­-edge technology that they neglect to gauge the relative importance of the particular problem they are trying to solve. For example, a pharmaceutical company saw unexpectedly high demand for a major drug, but inefficiencies in the drug’s production line prevented the company from increasing its capacity, resulting in stockouts across the distribution network. Adding shifts was not an option, because skilled workers were not readily available. But instead of focusing directly on improving the line’s capacity, the company’s “black belt”—a highly skilled operations expert—had been using advanced analytics to model ways to reduce the amount of material wasted in the production process (the scrap rate). At 1.5%, the scrap rate was indeed a costly problem. But the expert’s goal of reducing the rate to less than 1%, if achieved, would have yielded only a 0.5-­­percentage-point improvement in capacity, the line’s most pressing problem. The value of reducing the scrap rate paled in comparison to the value of raising the production line’s overall equipment effectiveness (OEE)—the ratio of actual production output to theoretical output at maximum line speed, with no stoppages, during the time the line is in operation—which was below 40%. The two largest contributors to the low OEE were planned-stop times (such as for changeovers) and breakdown rates, each contributing 30 percentage points. Drastically reducing the incidence of these events promised to improve capacity far more effectively than reducing the scrap rate could. Halving the duration of changeovers and other planned stops would generate a capacity improvement more than 30 times greater than the gains achievable through the expert’s scrap-rate solution. Recognizing this impact, the pharmaceutical company refocused its efforts on reducing planned-stop times, eventually achieving a significant increase in capacity. In order to reduce planned-stop times, experts and line leaders must understand and help change line operators’ behavior, rather than prematurely applying complex algorithms or advanced technology. This entails closely collaborating with line operators to analyze in detail the steps involved in a planned stop and gathering their input to identify ways to externalize, parallelize, shorten, or remove steps in the changeover process. Once the design for a new process is in place, operators and their line leaders require training and motivation to diligently follow it. Experts should serve as facilitators and coaches to instill the necessary behavioral changes. To prioritize their most important problems, leading companies conduct a formal and rigorous annual review of their current performance, defining ambitious stretch initiatives to close the gaps between current and potential performance. To ensure the right focus, they quantify and rank all improvement initiatives on the basis of their probable financial impact. Although not a silver bullet, these top-down continuous improvement exercises help companies focus on high-impact areas. In contrast, bottom-up continuous improvement activities, which are useful for motivating operators and instilling the appropriate culture, are seldom fully quantified in financial terms. (See The Power of Production Systems: Unlocking Lean in Decentralized Organizations, BCG Focus, June 2015). All too often, companies indiscriminately use advanced technology to automate or digitize non-value-adding activities or process steps (called waste in lean terminology). Such implementations look backward, seeking to improve existing ways of working without addressing underlying inefficiencies. Instead, companies should implement technology applications or behavioral solutions that aim to minimize or eliminate the root causes of waste going forward. By understanding the root causes of the seven types of lean waste, companies can identify ways to make their processes more efficient before introducing the digital solutions of an Industry 4.0 initiative. (See Exhibit 1.) The examples that follow illustrate the opportunities. Overproduction and Inventory. Manufacturers often invest in automation and sophis­ticated IT systems to manage their vast warehouse inventories. A better approach begins with understanding why inventory levels are so high to begin with. Many companies overproduce goods and maintain high inventory levels in order to create a buffer to meet demand. The buffer gives a company leeway in case its forecasts of supply and demand are inaccurate, or in case it finds itself struggling to synchronize activities across the supply chain or to deal with significant variability and disruptions from production or suppliers. Adhere rigorously and consistently to an integrated sales and operations planning process. Adopt pull systems, in which warehouses replenish their inventory only after it falls to a predetermined level. Collaborate with customers and share real-time information about downstream inventories at distributors or points of sale. Align incentives and organizational roles and responsibilities in order to eliminate behaviors that lead to over- or underforecasting. Use artificial intelligence to improve forecasting. Reduce the proliferation of stock-­keeping units. Accelerate changeovers and increase flexibility in production. Optimize the configuration of plant and distribution footprints. Waiting. Equipment stoppages and idle time are leading causes of low productivity. They often result from behavioral issues that manufacturers can address by strengthening frontline management. Transport and Motion. To transport items within plants and warehouses faster and more efficiently, many companies invest in expensive conveyor systems or automated guided vehicles. Before making such investments, however, they should consider whether they can reduce the need for internal transport by, for example, changing layouts or introducing pull systems with fewer inventory points. Overprocessing. When companies add unnecessary processing steps that customers are unwilling to pay for, the result is overprocessing. For example, if process parameters go out of bounds, companies may deploy sensors and control systems that take the process through extra steps in order to readjust the parameters to normal levels. In addition, they may use a tank or buffer storage to hold defective products temporarily before reworking or reprocessing them. But companies often take these steps without understanding what caused the parameters to exceed the process limits in the first place. To capture insights that make corrective actions possible, companies need to understand the basic science underlying each process. By leveraging big data to model and simulate processes (ideally during the design phase), they can identify ways to increase the robustness of their processes, thereby reducing the need for sensors and control systems as well as for tanks and buffer storage. Defects. Many companies use advanced intelligent technologies such as vision systems to help identify and sort defective products or batches. Often these technologies are a necessary short-term solution, but companies should also use technology to identify the root causes of defects so they can reduce or eliminate them. Big data and analytics allow companies to pool data from new sources (such as from customers) to gain a better understanding of where and why defects occur and what their root causes may be. Because many defects have behavioral origins, companies can reduce their defect rate by improving operators’ motivation or capability to perform at a high level. Low-cost or low-tech solutions, such as mistake-proofing equipment with simple mechanical stops or visual indicators, can be very effective, too. In our experience working across the industrial, consumer, and pharmaceutical sectors, companies too often ignore behavioral issues that may underlie the problems they are trying to solve. For instance, we have found that the root cause of many equipment breakdowns and malfunctions is behavioral, not technical. Consider the example of a food and beverage company whose filling and packaging lines frequently broke down. The sporadic work stoppages disrupted planning, played havoc with schedules, and wasted material. The company’s leaders liked the idea of using Industry 4.0 innovations to prevent breakdowns through predictive maintenance. They knew that advanced sensors can detect vibrations, equipment wear, noise levels, and other parameters that point to impending breakdowns, enabling artificial intelligence algorithms to predict a breakdown several hours or days in advance. A plant could use these predictions to schedule relatively inexpensive technical repairs and avoid unplanned breakdowns. But predictive maintenance is still maintenance. It does not address the behavioral causes of the conditions responsible for breakdowns. For instance, every few hours at the food and beverage company’s plant, operators must clean, inspect, and lubricate the filling and packaging lines, and adjust their parameters to the correct settings (a procedure known as centerlining). Because these tasks require a great deal of discipline and rigor, employees must be motivated and engaged to perform them properly. If employees do not follow the mandated maintenance routines, the equipment will require more interventions than it should, and eventually it will break down. When we analyzed the food and beverage company’s equipment breakdowns, we found that the root cause was in some instances lack of adequate operational standards and in others a failure to comply with existing standards that were adequate. These causes, in turn, reflected problematic leadership behaviors: production leaders had not trained, motivated, and supervised operators to follow the necessary standards. (See Exhibit 2.) But deleterious leadership behaviors are correctable. For example, the supervisor of one of the company’s flagship production lines spent more than 90% of his time in an office far from the shop floor, unaware and seemingly unconcerned that operators were not adhering to daily cleaning standards. In contrast, the supervisor of a similar line that suffered fewer breakdowns spent most of his time on the line, helping and motivating his team to work in accordance with the daily standards. Behavioral issues on the production line typically arise because operators and managers lack a sense of ownership. What social psychologists call the endowment effect causes people to place greater value on things they own. In the context of manufacturing, operators and managers who feel that they own their lines tend to run them better.1 Companies can foster a sense of ownership by improving leadership and motivating operators. Predictive maintenance may still be valuable in preempting breakdowns, but strengthened ownership will reduce the need for intervention. Companies that have established separate roles for operators and maintenance technicians should be especially wary of this problem. A good way to gauge a company’s susceptibility is to consider whether operators fix breakdowns themselves or call a technician. Operators who rely on technicians to make repairs tend to lack ownership of their line, increasing the likelihood that the root cause of many breakdowns is behavioral. Similar behavioral issues arise with respect to ownership of data. For example, a mining company wanted to apply its trove of production performance data to real-time monitoring, introducing electronic performance boards to replace the manually updated boards that were used in daily meetings to document performance. The electronic boards would eliminate the need for line and shift leaders to personally collect performance data, make any necessary corrections, and handwrite performance metrics. However, these manual activities may be crucial to imparting a sense of ownership of the data. In fact, several researchers have demonstrated that the processing that occurs when a person writes down information by hand may improve learning and retention.2 So when a company automates data collection, leaders may lose their personal connection and feel a diminished sense of ownership of the data. As a result, they may be less likely to scrutinize the data each day for mistakes and omissions and to use what they discover to improve line performance. Electronic performance boards are valuable for saving time and resources. But to maximize the boards’ effectiveness, a company must ensure that underlying behavioral issues do not have unintended and counter­productive consequences. The fundamental prerequisite is a culture that encourages leaders to take ownership and pride in their line’s performance. Recognizing this, the mining company decided to delay the implementation of its electronic boards until it had upgraded leaders’ behaviors. Far too often, companies yield to the dazzle of Industry 4.0 without considering hidden costs of implementation and without weighing the possibility that low-tech solutions might handle some processes more simply and inexpensively. The seductive power of Industry 4.0 solutions is on full display when production technology experts gather for peer meetings. Presenters proudly showcase their most recent work with complex 3D modeling solutions, the latest high-tech gadgets, or artificial intelligence algorithms. Frequently absent from these discussions is any comparison of the high-tech solutions’ potential impact and resource requirements with those of simpler alternatives. To understand the problem of hidden costs, consider process automation. Clearly, process automation has revolutionized manufacturing during the past 50 years. But in justifying investments in automation, companies often evaluate only the direct cost savings (such as reducing the number of production line employees) and only cursorily review the fixed costs that the changes add. To automate processes effectively, companies incur incremental costs to employ technicians and engineers to operate and repair the new technologies, and they must enter into service agreements with equipment suppliers. Many companies also overlook the impact of automation on throughput. Throughput often falls short of expectations because equipment breaks down more frequently than expected (a common phenomenon with new technology) or because automation diminishes flexibility. For example, rigid metallic structures, such as automated conveyor systems, impose constraints on a production line’s structure and speed. Although the problem of hidden costs persists, recent technological advances make it easier for companies to reduce fixed costs and improve flexibility. For example, the use of indoor GPS and RFID tags permits flexible layouts of shop floors and production lines, and smart collaborative robots can work side-by-side with humans and can be rapidly reprogrammed for diverse tasks. Digital technologies often bring significant hidden benefits related to improvements in quality, traceability, and speed, too. These benefits may compensate for hidden costs, but often they do not. The other danger in the area of accurate cost evaluation involves failing to gauge the relative value of low-tech solutions to some process problems, which many companies overlook in their haste to adopt the latest digital technology. Even though bandwidth, cloud infrastructure, and processing power have become dramatically less expensive in recent years, many low-tech solutions ­remain more cost-effective than the digital alternatives. To invest wisely, companies need to compare the potential impact and resource requirements of high-tech solutions with those of simpler alternatives. To improve their insight into costs and savings, companies should develop a business case for each Industry 4.0 investment under consideration. The evaluation should take into account all direct costs and savings, expected improvements in production efficiency, additional indirect costs (such as for service and technical support), and effects on flexibility and quality. Companies should compare this business case to alternative low-tech (and low-cost) solutions. Ultimately, even if a low-tech solution is more economical, a company may prefer to invest in an Industry 4.0 solution to promote learning, but at least it will know the decision’s true costs and benefits. 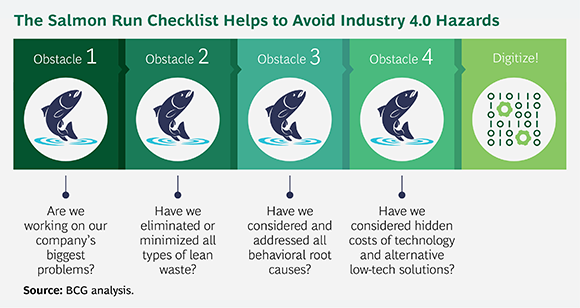 We have devised a checklist we call the salmon run—because it mimics the way salmon clear obstacles in their journey upstream to spawn—to help companies avoid hazards associated with Industry 4.0 initiatives. (See the exhibit.) It lists questions that a company should ask before investing in technology to solve its operational performance problems. The salmon run framework is particularly useful for assessing solutions that attempt to fix non-value-adding steps (lean waste). Industry 4.0 investments designed to create value in new ways—for example, additive manufacturing—do not require evaluation through the salmon run. Before proceeding, a company should assess whether the proposed investment has positive net present value and will generate sufficient returns to pay for itself within the company’s payback guidelines. One common denominator among companies that run into trouble with Industry 4.0 initiatives is a culture that values technology more than it does rigorous application of tried-and-true manufacturing practices. Companies should consider what kind of culture they promote, implicitly or explicitly. Is the hero the vocal proponent of the latest automated production project or the disciplined and respected line manager who fosters a culture of continuous improvement? Is the flagship factory new and highly automated but lacking in world-class operational metrics, or is it an older facility that runs efficiently with well-maintained 30-year-old equipment? Companies that focus on sound manufacturing practices even as Industry 4.0 solutions proliferate can be sure of applying the right solution to the right problem in addressing their pain points. Industry 4.0 should play a major role in any operational excellence program today. Indeed, many of these powerful technologies are essential to improve the efficiency and effectiveness of manufacturing processes, build capabilities, increase employee engagement, and minimize risk. By avoiding the hazards we have discussed, companies will be ready to invest in the most valuable Industry 4.0 applications and thereby realize the promise of today’s manufacturing revolution.